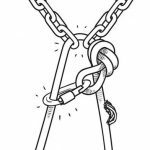 Rigging a multiI-point belay anchor is one of climbing’s fundamental skills, but not all anchors are created equal, and probably shouldn’t be treated the same. 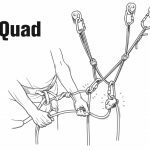 As an examiner and instructor for the AMGA, I’ve sorted through the various methods, and find “The Quad” anchoring system beneficial in many situations. 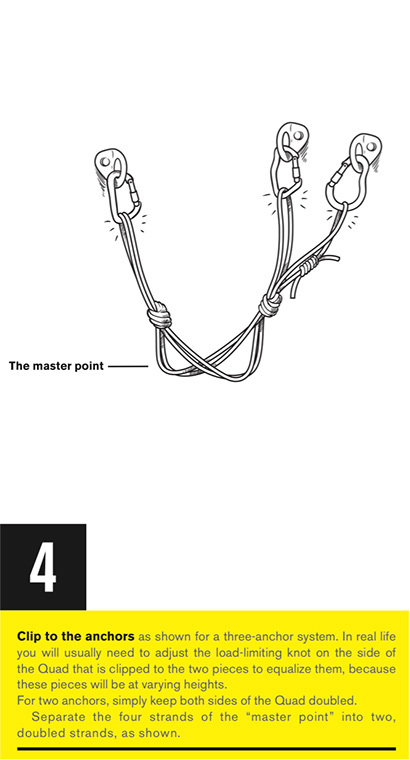 RIGGING A MULTI-POINT BELAY ANCHOR is one of climbing’s fundamental skills, but not all anchors are created equal, and probably shouldn’t be treated the same. 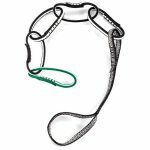 As an examiner and instructor for the AMGA, I’ve sorted through the various methods, and find “The Quad” anchoring system beneficial in many situations. 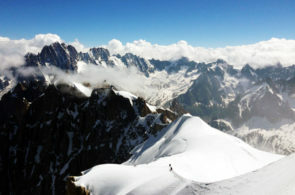 As it sounds, The Quad uses four strands of a standard cordelette to provide anchor points for two, three or even four anchors, but is most often used to connect a two-piece anchor such as bolts or ice screws. The Quad is a self-equalizing anchor system that adjusts to off-center loading, an advantage over the traditional “pre-equalized” system. 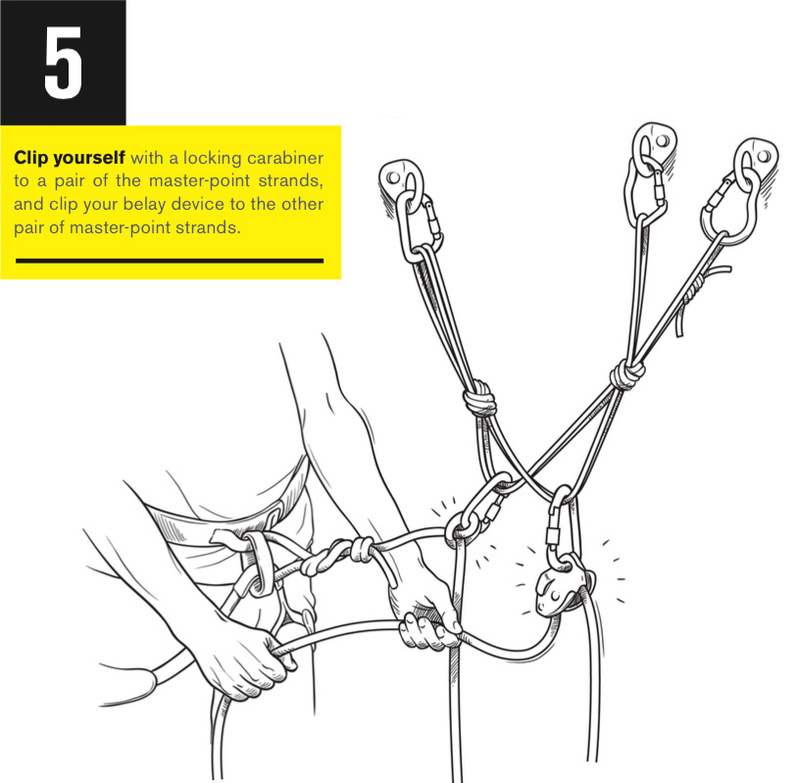 The Quad is quick to tie, works in most situations, and provides separate clip-in points for the belayer and climber, preventing them from jamming up at the same master point. On routes where you have bolted stations that are approximately the same, you can keep The Quad tied, making it even more efficient. To rig a Quad, follow these easy steps. 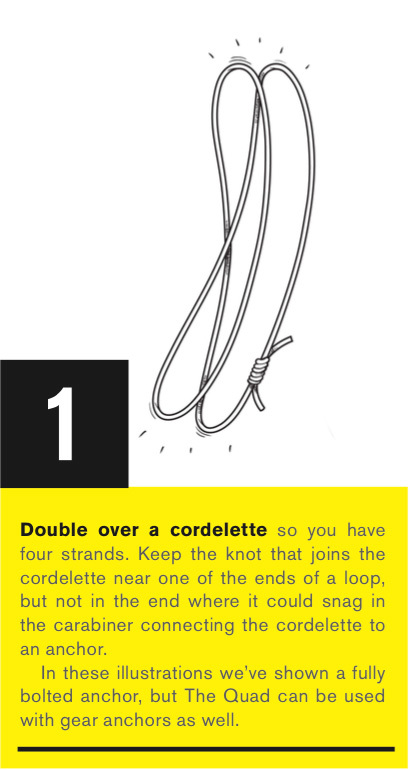 The pre-equalized system that also uses a cordelette is popular when the anchor consists of more than two pieces, but this system has down sides. Rarely does a pre- equalized system actually equalize the load. Depending on the configuration and direction of pull, this system can put large loads (up to 100 percent) on one of your pieces. 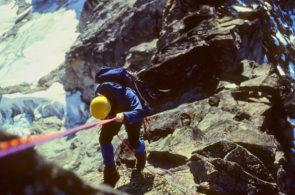 A stance where the pitch traverses into the belay is an example of where The Quad might be more appropriate, since determining where the load is going to be when you tie a pre-equalized system is nearly impossible. Using The Quad lets the master points shift to equalize the load regardless of the direction of loading. 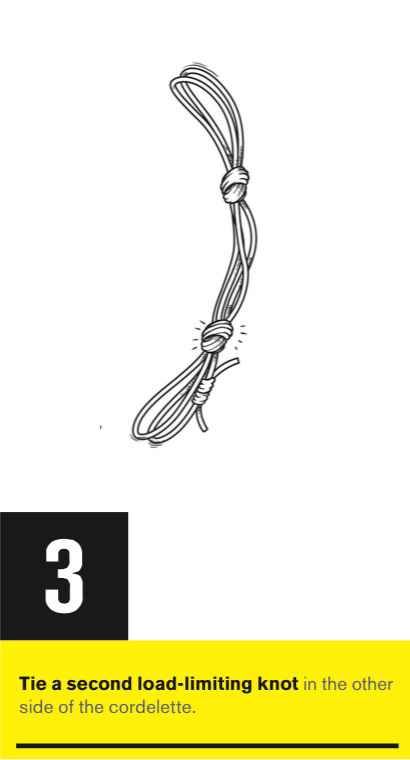 If your station has three anchors, one that is bomber and two that aren’t so great, sharing the load three ways, such as you’d get with a pre-equalized system, doesn’t make sense, and it may put most of the load on one of the smaller pieces if the direction of pull shifts or your knot wasn’t tied perfectly. Imagine two “pretty good” finger-sized pieces combined with a bomber hand-sized piece. 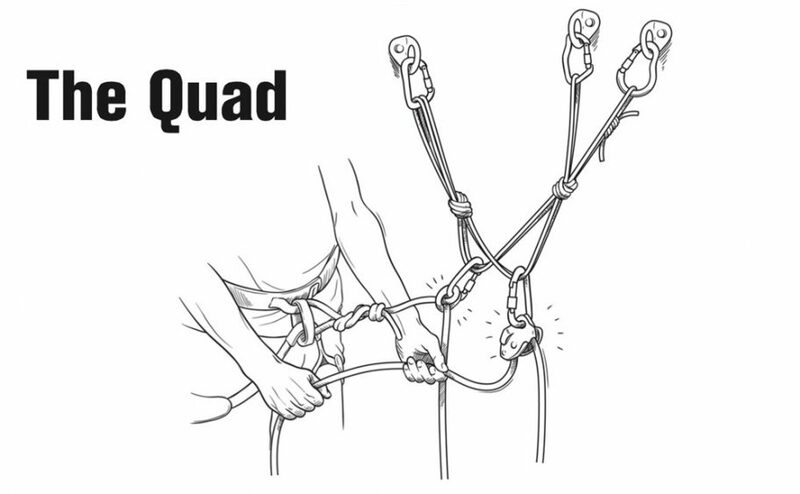 In this instance, The Quad, when tied as shown in the illustrations, puts 50 percent of the load on the most bomber piece, and 25 percent of the load on each of the other two pieces. 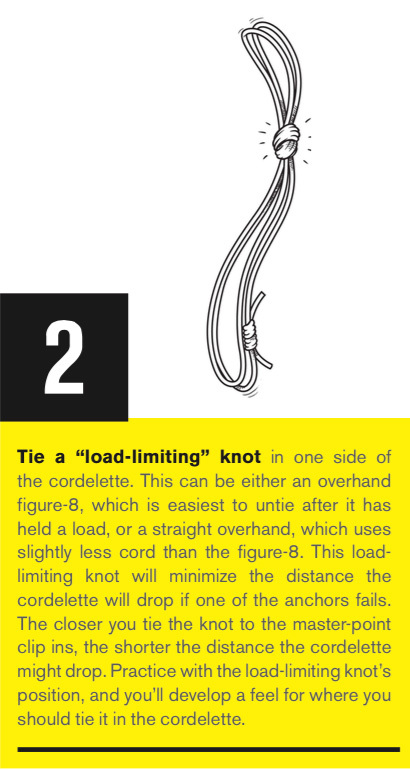 The Quad is unlikely to be your “one size fits all” solution to your rigging, but is another effective tool to have in your kit. 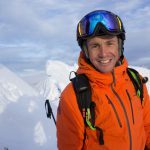 Jeff Ward is an IFMGA-licensed and AMGA-certified Alpine, Ski and Rock Guide. 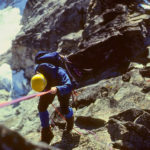 He grew up in the Northwest and is co-owner of North Cascades Mountain Guides (www.ncmountainguides.com) based in Mazama. 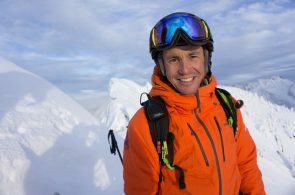 Ward is a lead instructor for the American Mountain Guides Association and serves on their technical committee. This article was published in Rock and Ice issue 237 (October 2016).